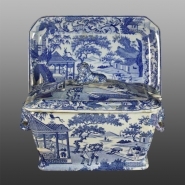 Shown here is a large soup tureen with stand in the same Chinese Traders pattern. A retangular earthenware platter from a dinner service with indented rim and combed back printed in blue underglaze in the Chinese Traders pattern. The pattern depicts traders carrying produce across a bridge. See below a large soup tureen and stand in the same pattern.